I've gotten a little rush of bird identification questions lately, and most have pertained to one particular species. 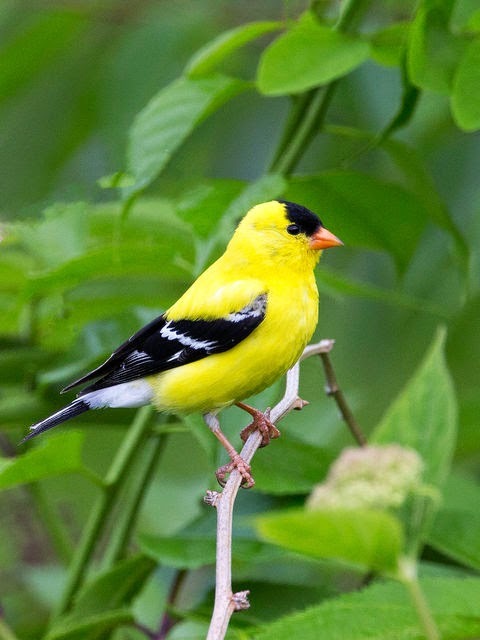 Every spring the American goldfinches transform from their winter plumage to their breeding plumage right before our eyes. While the adult males in the breeding season are pretty unmistakable, the winter plumage and transition plumages sometimes confuse feeder observers. In the winter, the American goldfinches look like the bird on the right side of the feeder. 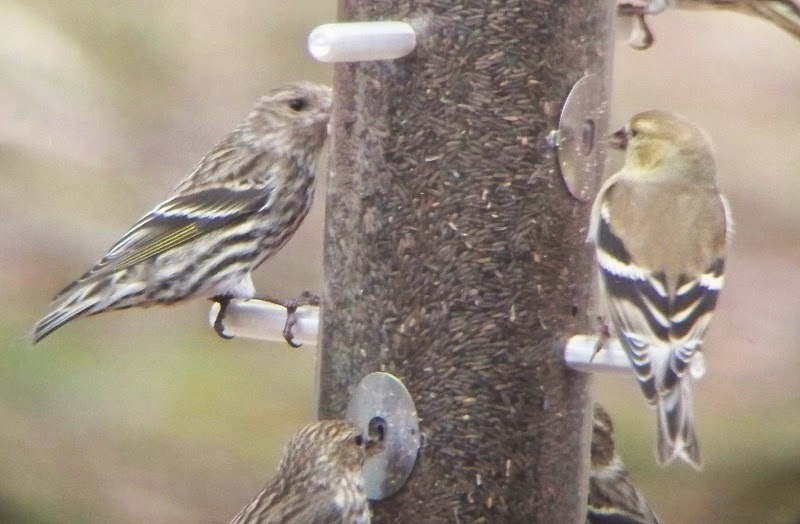 The bird on the left is a pine siskin. The two species often occur together. 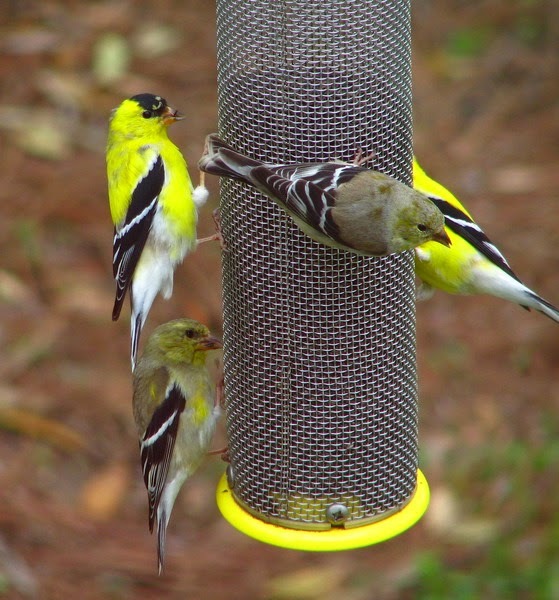 Many casual backyard feeder watchers are unaware of the plumage changes the goldfinches go through during the year. In the winter they are brownish-gray with perhaps a hint of dull olive. The wings are black with white stripes. By this time of year, the males are starting to acquire the bright yellow plumage that most people are accustomed to seeing. Note the patchy yellow coming in among the patches of gray winter plumage, and the aquisition of the black cap. The females show this transition too. This bird is starting to show the yellow coming in, but it is not as bright, since this is a duller female bird. In a few weeks the transformation is complete. The adult males have assumed their strikingly brilliant summer suits. You may continue seeing the goldfinches at your feeders throughout the summer. Here is a mix of adult males and adult females. The females will be a yellow-green when nesting but will be more gray in the winter. Both males and females have the black wings with prominent bars or stripes throughout the year. 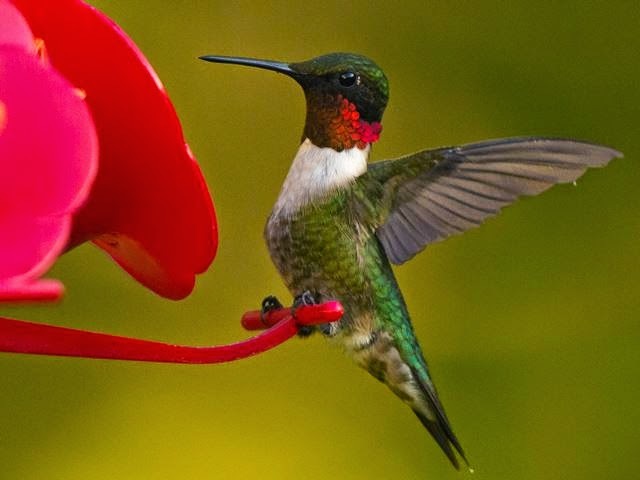 Within the next week some of you will see the first returning ruby-throated hummingbirds of the year. I have seen them as early as March 31 myself, but sometimes they can arrive even earlier than that. But by April first or second I am getting a constant stream of reports of newly-arrived hummingbirds. The first sightings will likely be of adult males. They arrive first to find territories and to await the females who are not far behind. 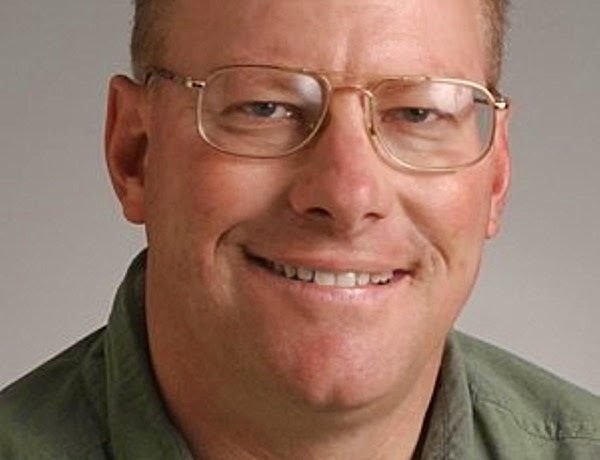 These first birds are likely just passing through and may not stay long, so don’t fret if you go a few days without seeing any after your initial sighting. The breeding birds are on their way. 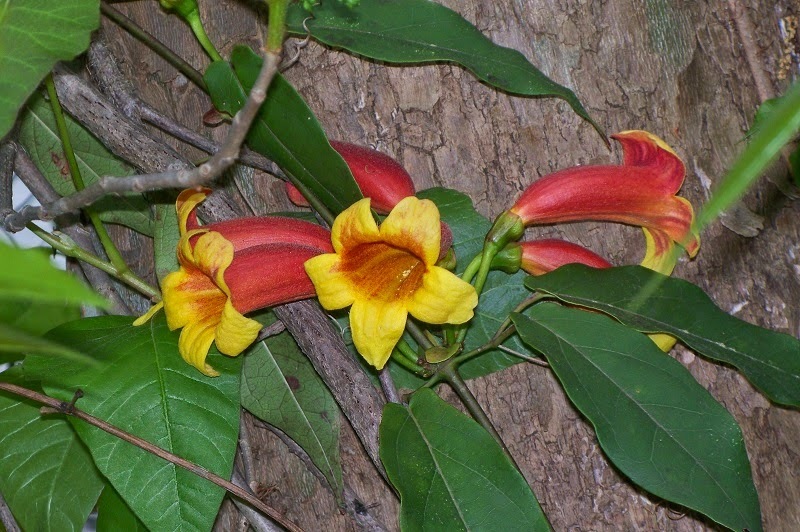 It seems the arriving hummingbirds time their movements north with the blooming of crossvine , a fine native climbing plant with large, showy trumpet-shaped flowers that is common in low woods. And of course, tiny spiders and flying insects become abundant very quickly after temperatures warm, so there is ample protein for the hungry birds too. The ruby-throated hummers also come in shortly after the wintering rufous hummingbirds depart. This winter was an off-year for wintering hummingbird numbers, not just in Mecklenburg County but across the whole Eastern United States. I am aware of only three birds that spent the winter in Mecklenburg County, down from an average of over a dozen for most winters. One bird has already departed and I expect any still hanging on to be gone in the next week. The photo below is of a female rufous hummingbird that spent the entire winter in Mint Hill. That little beauty weathered single-digit temperatures and a couple of bouts of frozen precipitation. The photo nicely shows the rufous colors on the tail, a characteristic that ruby-throated hummingbirds never show. If you have hosted a hummingbird this winter and have not reported it, I encourage you to let me know. I try to track the numbers and locations of the wintering birds. So if you brought your feeders in last fall and haven’t put them back up yet, time is running short if you want to get in on the initial push of the ruby-throated males. And please let me know when you sight your first hummingbird of the year. 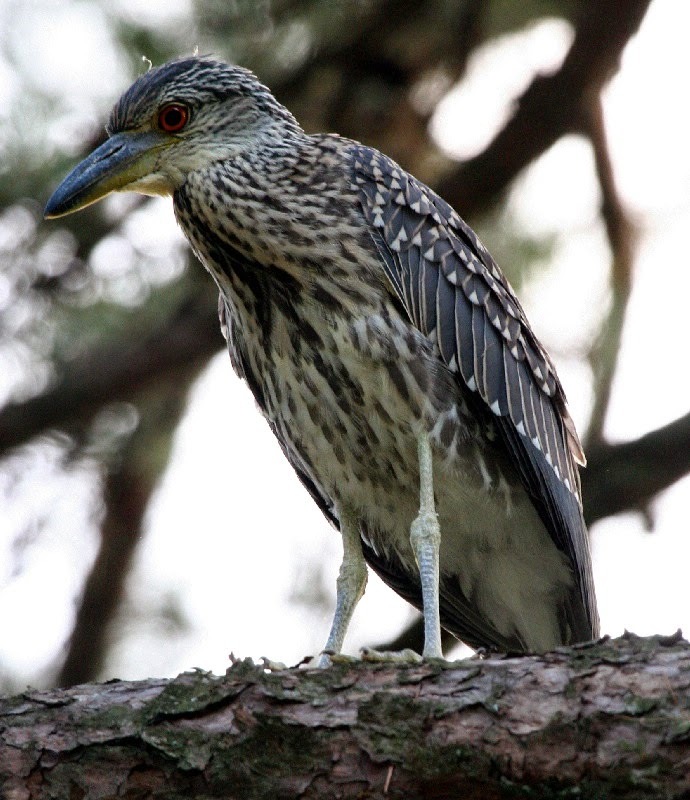 The yellow-crowned night-herons have returned once again to their established nesting sites in Mecklenburg County. These are spectacular birds that become neighborhood celebrities wherever they choose to set up housekeeping. There are only three known active locations in the county; Myers Park, Plaza-Midwood, and Mallard Creek Greenway. The Myers Park and Plaza-Midwood sites have been active for years. The first pair arrived about a week ago and hopefully will be joined by a few others. The birds show a strong site-fidelity meaning they return to the same tree every year. If the previous year’s nests are good shape they just do a little readjustment and adding of sticks. If they need a new nest they will just build a new one in the same spot. Their favorite food appears to be crayfish that they catch in the urban creeks within the city. Briar Creek seems to be a favorite foraging site for these birds. True to their name they fish mostly at night. Days are spent quietly roosting in the willow oak or pine tree nest site. 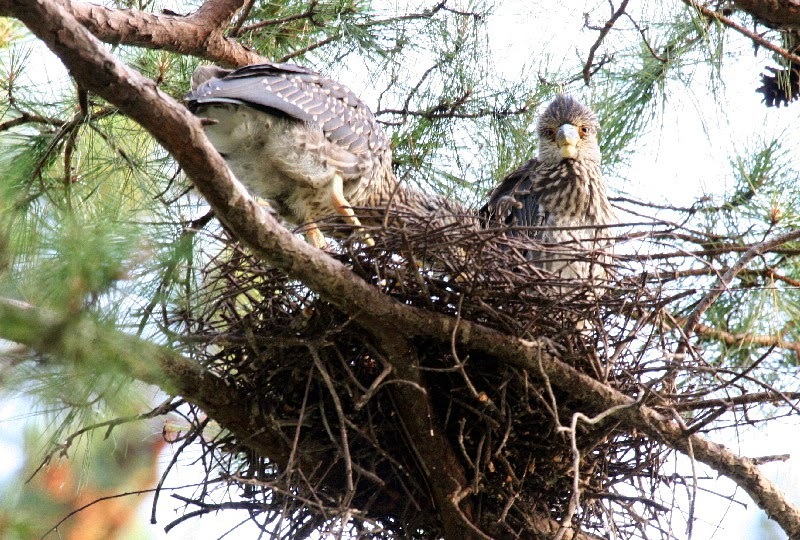 Even though the nests are in densely populated areas they would largely go unnoticed except for the large amount of white wash that accumulates under the roost trees. 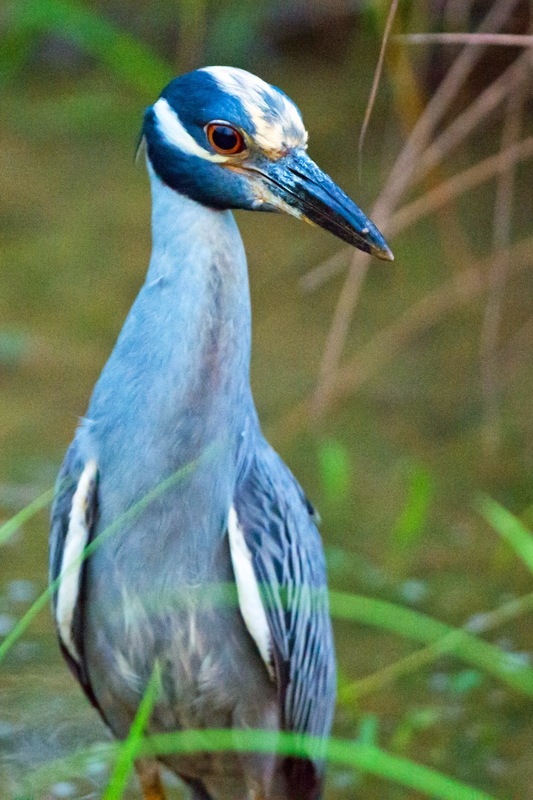 The yellow-crowned night-herons are one of my favorite examples of wildlife adapting to an urban habitat. Below is a fledged juvenile from the same site. Note the juvenile plumage of brown and cream streaking and spotting. Also note the stout bill, perfect for grabbing and crunching crayfish, a favorite food. I visited the Harrisburg Road Sports Complex property yesterday specifically to look for early returning Louisiana waterthrushes. This species is usually the first warbler to come back to their nesting territories in the spring. They don't need to wait for the foliage to come out because they do not get their food by gleaning insects off foliage. They instead wade right into the shallow portions of creeks and streams, turning over leaves and other debris to find aquatic invertebrates. 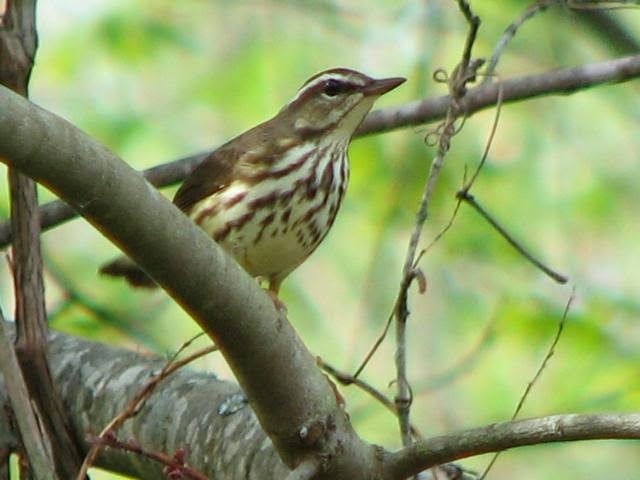 I walked a section of Reedy Creek and almost immediately heard the clear, ringing song of the waterthrush. March 22 is the earliest I have ever heard the song. Another reason I was glad to hear it is that Louisiana waterthrushes are indicators of a healthy stream. 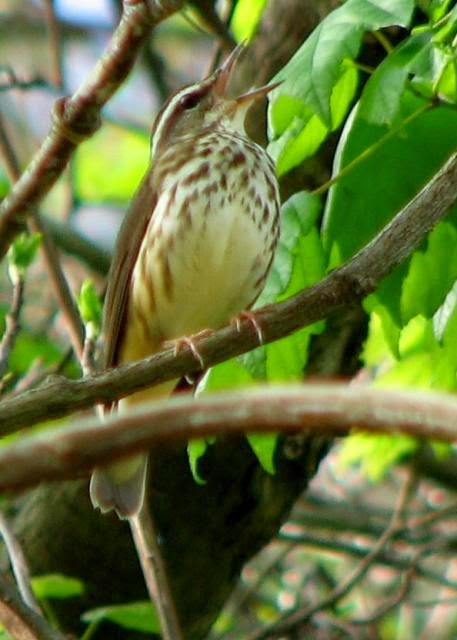 Louisiana waterthrushes are persistent singers in early spring. Listen for them along streams in deciduous woodlands. 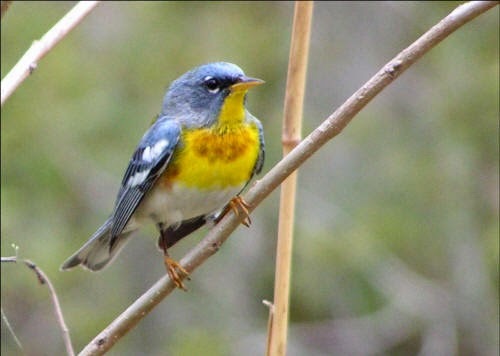 I also heard a report of a Northern parula warbler from Six-Mile Creek Greenway. This is another early spring warbler but I was not expecting them to be back this early. Usually its around March 30 when I hear the first one. Six-Mile Creek is a reliable location for them from now until September. Listen for their rapid buzzy song that slides up the scale. I took advantage of warm temperatures yesterday to take a stroll through an undeveloped property in Matthews. Apparently the near-80 degree temperatures put the birds to sleep but as consolation, they brought out the first butterflies of the season. 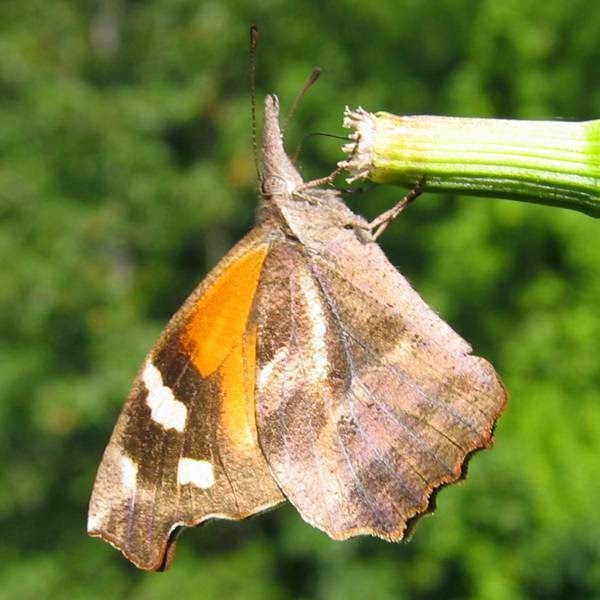 Many birders also enjoy butterflying and will often keep butterfly lists just as they will for birds. 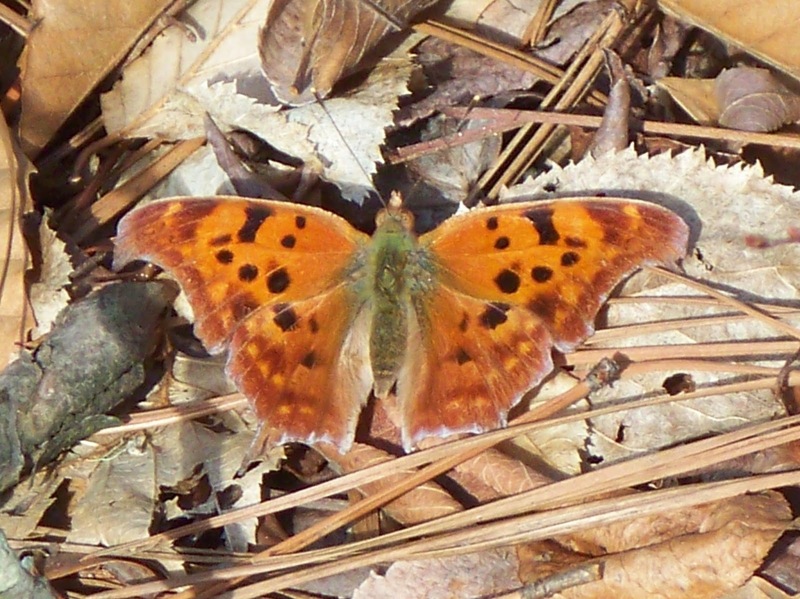 Early spring is the only time of the year that some species can be observed on the wing. There is perhaps a window of just a few weeks to find some flying adults. If you miss out, there is a whole year to wait until another chance rolls around. Yesterday I encountered three species, American snout, questionmark, and sleepy orange. All of those species will be around till fall, but it was still great to see them after a long, cold winter. Below are a few photos of the species observed yesterday. American snouts are named for their elongated mouthparts, evident in this photo. Questionmarks are "anglewings", named for the irregular borders of the wings. They overwinter as adults and can be seen even in mid-winter if there is a string of days with well above average temperatures. Questionmarks get their name from the silver markings on the underside of the hindwings. You can see two markings forming the shape of a question mark; with maybe a little imagination. Sleepy oranges belong to group of butterflies called sulfurs. The primary colors are often bright yellow, orange of white. The colors are easily seen when the insect is in flight, but when at rest this group keeps the wings folded over the back, like in this photo. In flight the sleepy orange falshes a bright orange as it slowly flies past you. 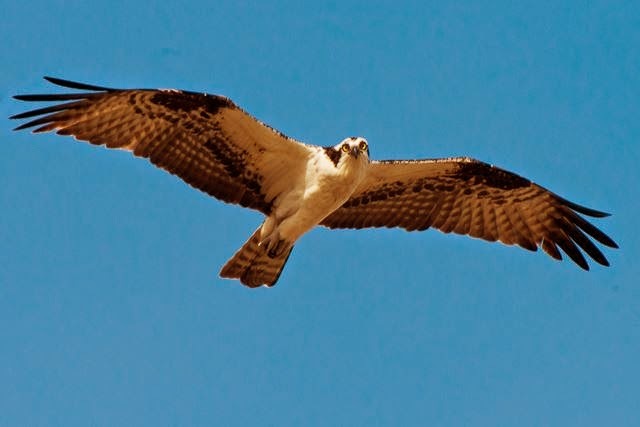 As area breeding birds continue their spring returns, the latest arrivals are two species of swallows and the high profile osprey. Like the fish crows a few days ago, the ospreys appeared suddenly and in good numbers. Theirs was not a gradual arrival; they arrived March sixth and seem to be settled in across the county already, at work staking out nest sites or refurbishing nests from previous years. Look for the large platforms of sticks on channel markers along the Catawba River or on towers along the high tension power lines. 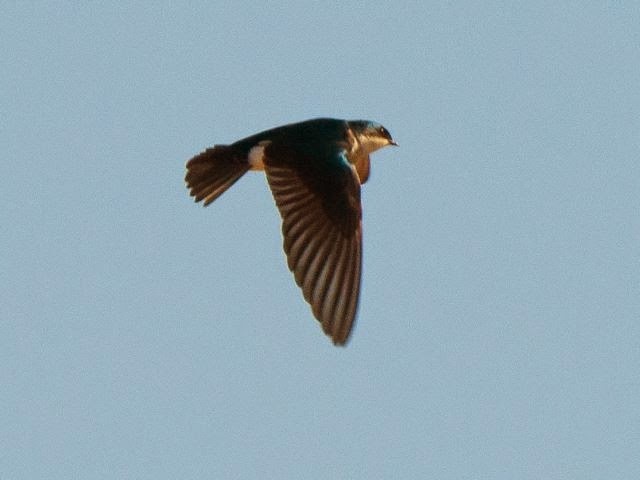 Tree swallows were reported from two locations for the first time this year on Friday. Yesterday I checked some area ponds and found three flapping and gliding over the water's surface, skimming minute insects off the surface or snatching them in midair. The tree swallows were joined by two Northern rough-winged swallows, new arrivals as well. Look for swallows skimming low over lakes and ponds right now. Recognize tree swallows by their iridescent green upperparts and immaculate white underparts. This swallow readily accepts nest boxes in open country near water as nesting sites. 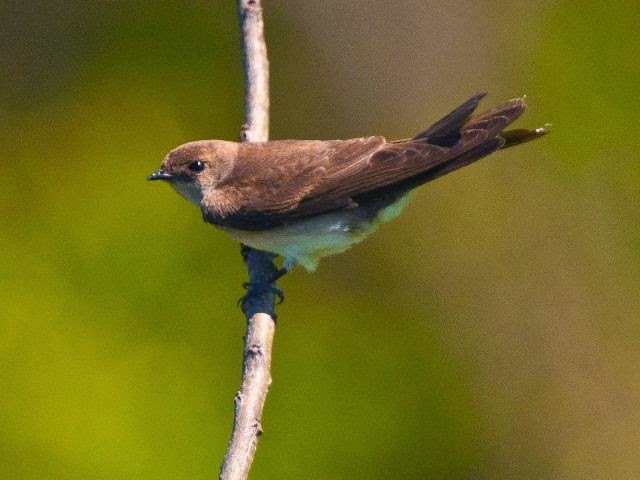 Northern rough-winged swallows are among the drabbest birds we have. Plain gray-brown upperparts and dingy paler underparts. They can be found at just about any small body of water including small retention ponds. Oddly, this species seems especially fond of choosing the undersides of parked tractor trailers as nest sites. Purple martins and barn swallows should be the next swallows to appear any day now. OK, its not all that exciting but fish crows returned to Mecklenburg County yesterday, March fifth. They are a little late this year. I usually notice them by the end of February. They really are the first harbingers of spring to show up. I had a flock of 13 birds fly over my house and I promptly sent out a report on their arrival. I received several responses letting me know that other area birders had noticed them for the first time yesterday as well. So I suspect they literally rode in with the warm, almost tropical air yesterday morning. American crows are with us here all year round but the fish crows withdraw to more coastal areas in the winter. By February they are following the major rivers back into the piedmont of the Carolinas. I notice them by their characteristic call, a nasal car car, easily distinguished from the American crow's loud and raucous caw caw caw. Otherwise they are virtually identical to each other. The fish crow is a bit smaller and has a smaller bill but unless I see them side by side I cannot tell them apart. Habitat can be an identification aid. 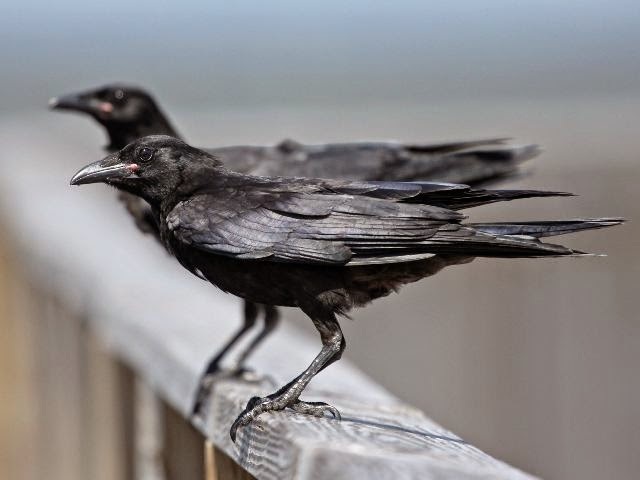 Despite their name, fish crows seem to have adapted to urban environments more than the American crow. By true spring the fish crows will be staked out in shopping center parking lots, perching atop light posts calling constantly. More spring migrants will follow closely on the wings of the fish crow. I'll keep posting as these other species begin to filter in. 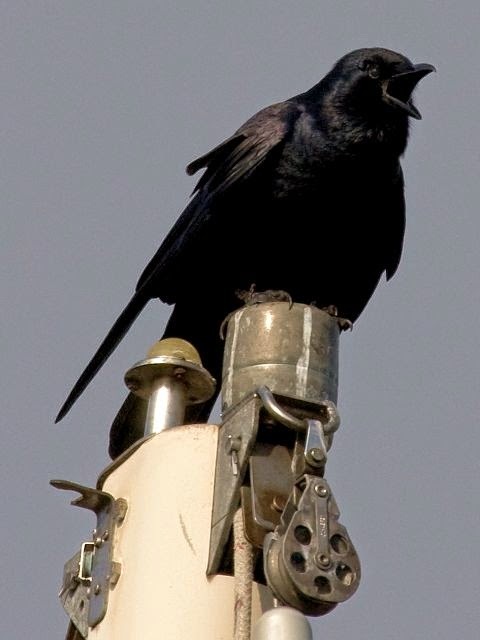 This is a typical location and posture for our area fish crows, calling constantly from a man-made, elevated perch. Look and listen for them in shopping centers. Cotswold is a regular location for them but they occur throughout the county. 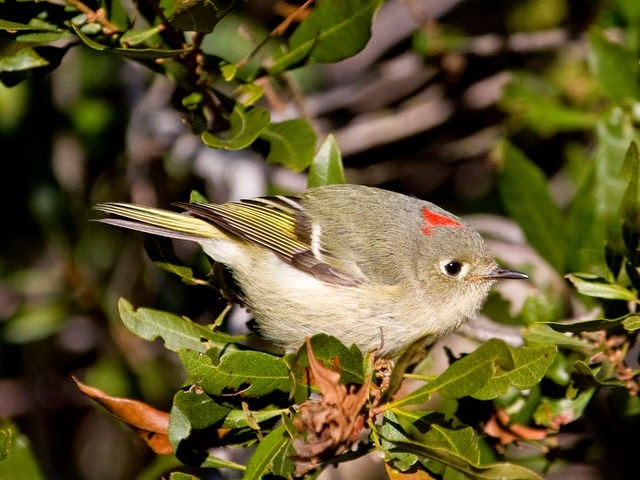 Ruby-crowned kinglet: These tiny balls of energy may visit offerings of suet or suet dough. Look for a small greenish bird with a bold eyering and bold wingbars. The males have a red patch of feathers on the top of the head. When they get agitated the feathers are raised, revealing the ruby crown. 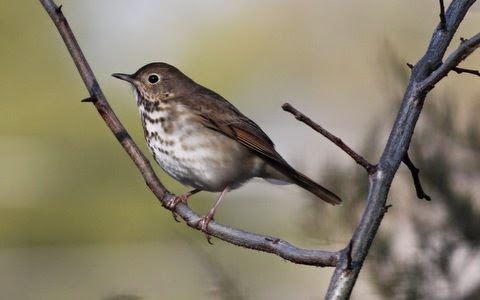 Hermit thrush: These woodland birds start to show up under feeders, gleaning the dropped food from above. They are almost exclusively ground feeders by now; the winter berries that they love being long gone from trees and shrubs. 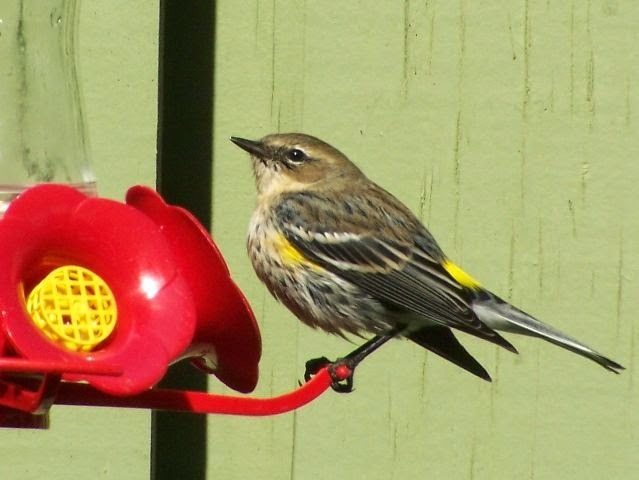 Yellow-rumped warbler: I get a lot of photos of this species this time of year. They will visit suet offerings and glean seeds from the ground. The brightest individuals will have yellow patches on the sides and a prominent yellow spot above the tail. This can be easily seen when the bird flies away from you. 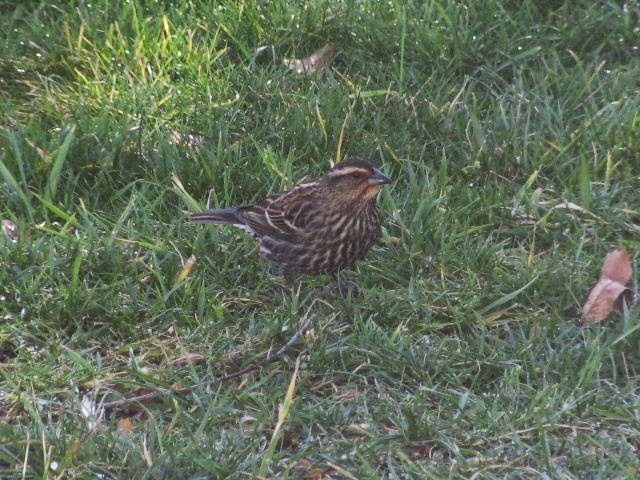 Red-winged blackbird: This species will drop in as they pass through to their breeding grounds. Adult males are easy to pick out, but immature males and females can be confusing. The young males have the characteristic light stripe on the wing but the red patch may be underdeveloped as yet. The plumage is a mixture of black feathering with brown or straw colored tips or edges. The females do not look anything like a blackbird, being heavily streaked with light brown or straw colored markings. 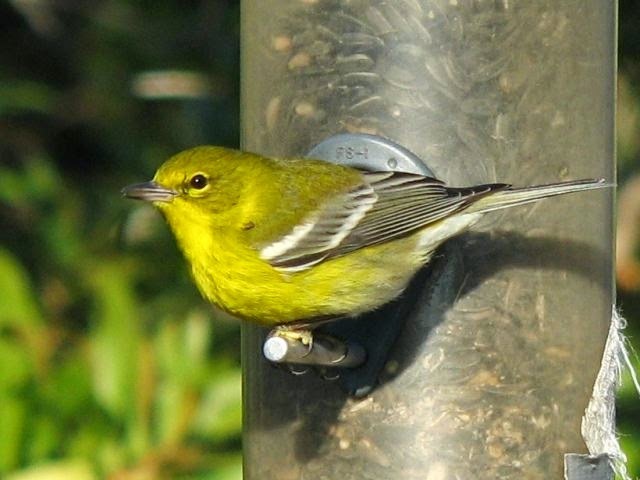 Pine warbler: The bright yellow males are eye-catching when they fly in to partake of suet offerings or to glean sunflower seed bits off the ground or platform feeders. The females can be almost devoid of yellow but usually have at least a yellowish blush on the breast. It is estimated that the population of rusty blackbirds has declined by as much as 95% in the last fifty years of so. this is one of the most precipitous declines ever noted for any North American bird. 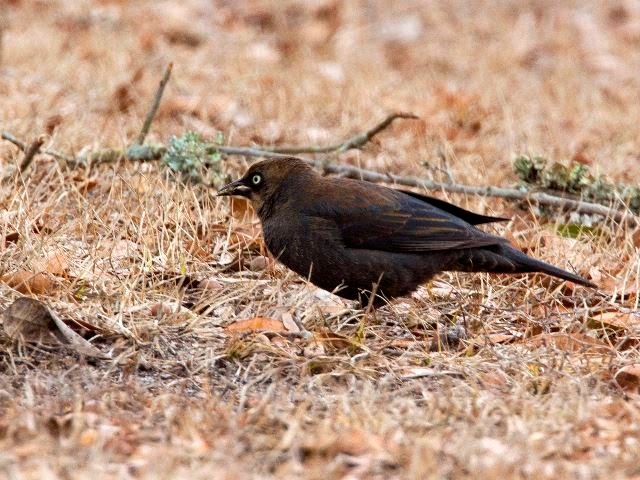 Rusty blackbirds use wooded lowland swamps in the Southeastern United States as their primary wintering grounds. They can be found right here in Mecklenburg and surrounding counties in appropriate habitat. Four Mile Creek Greenway, Lower McAlpine Greenway, and McMullen Creek Greenway can be especially good locations, but any where there is standing water in lowland hardwood forests will attract them. 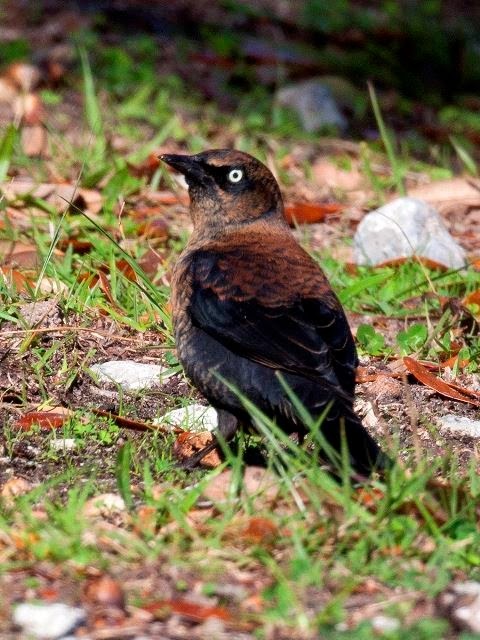 To help better understand the decline and basic requirements of this species, the Rusty Blackbird working Group has been formed to collect migration data and favored wintering spots. For the entire month of March birders observing rusty blackbirds are encouraged to enter their sightings into a database. Rusty blackbirds have piercing yellow eyes and rusty feather edges in fresh plumage. By spring, the birds have molted into an overall dull charcoal color. 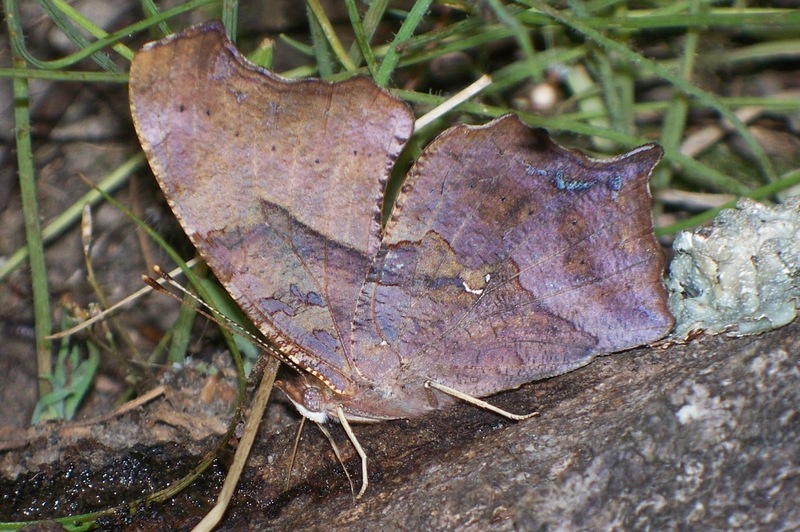 Look for them as they pass through in March in hardwood swamps with puddles of standing water.